Califone International has begun shipping a new document camera designed for classroom use. The new model offers an image recognition feature and single-click multimedia presentations. 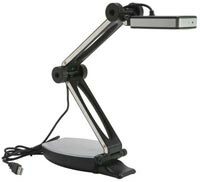 The Diggiditto Smart Document Camera is a USB-powered 2 megapixel document camera that can be detached from its flexible pedestal. Using image recognition, the camera can automatically call up a saved image based on a document being placed under the camera. It can also link to audio and video recordings, allowing teachers to create single-click multimedia presentations, according to Califone. The Diggiditto Smart Document Camera is available now for $599 with a portable stand. It requires Windows 2000, XP, or Vista. Further information can be found here.